Ireland and Wales played to a 16-all draw in their Six Nations Championship opener at Dublin’s Aviva Stadium (Lansdowne Road). 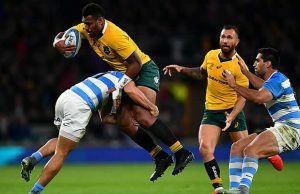 The result is the first time the two nations have played to a draw since 1974 and came about as both teams scored one try, three penalties and one conversion. Wales suffered a blow before the kick off as full-back Gareth Anscombe was ruled out due to a tight hamstring which forced Warren Gatland to start the match with Scarlets’ Liam Williams at 15. Williams had only played an hour of rugby since a foot injury ruled him out of last year’s World Cup. Meanwhile Anscombe is expected to be able to train again next week ahead of Wales’ match against Scotland. 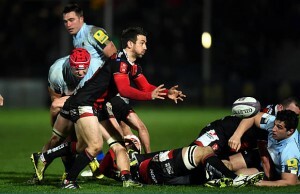 Wales also lost flyhalf Dan Biggar to an injury after 20 minutes of the match. Ireland raced out to a 13-0 lead in the match but then Wales picked away at their lead and by half time were trailing by three points after a try from Toby Faletau. Wales went into the lead in the final quarter with a penalty kick from Rhys Priestland but then Jonny Sexton levelled the scored with a penalty. Ireland coach Joe Schmidt will be thrilled by the display of his injury ravaged squad, with Munster and South African flanker CJ Stander rewarding his boss’s faith by winning the man of the match award on his Test debut. Both sides face injury worries ahead of next week though, with Sexton, Keith Earls, Tommy O’Donnell and Dan Biggar all leaving the field injured in what was a hugely physical encounter. Truth be told, the physicality was the only part of the script that went as expected, and at half time the home fans must have been wondering where the pre-match pessimism had come from. With the likes of Paul O’Connell, Cian Healy, Sean O’Brien, Rob Kearney and Peter O’Mahony missing it was thought the hosts would struggle badly, but they defied expectations, storming into a double digit lead inside the half hour. Wales might point to the enforced change just before kick off when Liam Williams came in for the injured Gareth Anscombe at full back, and they lost Biggar on 21 minutes after he failed to run off an early injury, but other than that it was a full strength side. The Lansdowne Road crowd were treated to an enthralling opening half of rugby, with reigning champions Ireland going through 20 phases in the first four minutes before Sexton kicked the first penalty of the game. Wales then had their own period on the front foot, but could not find a way past the Irish defence, with Earls and Andrew Trimble making huge defensive efforts. Sexton made it 6-0 after a Zebo surge brought Ireland deep into Welsh territory, and just minutes later the TMO was called into action when South African-born Stander looked to have crossed the line, but Ireland had to make do with a five yard scrum instead. 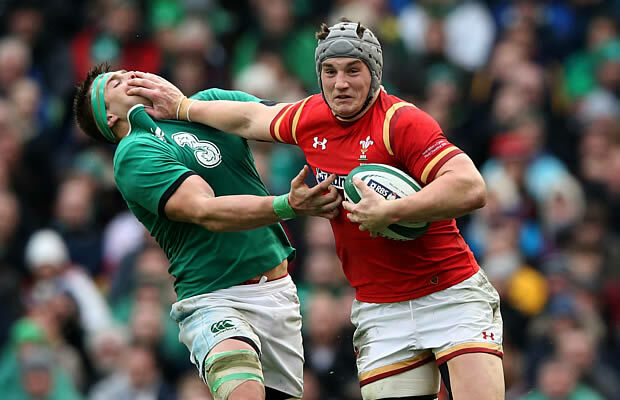 The Irish scrum, that would later wobble, stood strong, and scrum-half Murray dummied his way past Justin Tipuric, nipping over for the opening try. Sexton’s conversion put 13 points between the sides, but Priestland’s first kick of the day put Wales on the scoreboard, as the visitors began to rumble. Trimble fluffed by carrying the ball across his own try line to give Wales a scrum platform with the break approaching, and after dominating three set pieces, Taulupe Faletau rolled off the back, spotted a gap and powered home to give the Welsh a crucial try just before the turnaround. A Priestland penalty drew the sides level six minutes after the restart, but the scoreboard operator was given a break for the next 26 minutes, as the lung bursting pace began to slow. Both sides created chances but Scott Baldwin knocked on near Ireland’s 22 with men outside, and when Sexton made a stunning break through the Welsh midfield, Tom James covered well to drag the flying Trimble into touch. Wales drip fed their more experienced bench as the clock ticked by, and the pressure looked to eventually pay off when, after almost 30 phases, Ireland coughed up a penalty on 72 minutes. Priestland nailed it to give Wales the lead for the first time, but having worked so hard to get ahead, Williams gave away a soft penalty just two minutes later. Despite being withdrawn just one minute after that, Sexton took the kick and slotted it home to level the game once more. Priestland was given the chance to become a Welsh hero with a late drop goal attempt, but the Bath star pulled his attempt wide and it was hard to argue either side deserved to lose. Simon Zebo; Keith Earls, Jared Payne, Robbie Henshaw, Andrew Trimble; Johnny Sexton, Conor Murray; Jamie Heaslip, CJ Stander, Tommy O’Donnell; Mike McCarthy, Devin Toner; Nathan White, Rory Best, Jack McGrath. Replacements: Sean Cronin, James Cronin, Tadhg Furlong, Donnacha Ryan, Rhys Ruddock, Kieran Marmion, Ian Madigan, Dave Kearney. Liam Williams; George North, Jonathan Davies, Jamie Roberts, Tom James; Dan Biggar, Gareth Davies; Toby Faletau, Justin Tipuric, Sam Warburton; Luke Charteris, Alun Wyn Jones; Samson Lee, Scott Baldwin, Rob Evans.